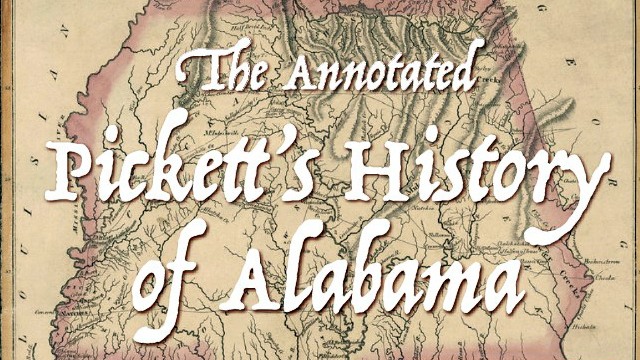 Why “The Annotated Pickett’s History of Alabama” is the perfect book for the state’s bicentennial from Alabama NewsCenter on Vimeo. Given the importance of the work, Pate discussed with publishers the need to have the publication re-released, as early editions were too costly and facsimile copies were of poor quality. After nearly two decades of discussions and painstaking research, NewSouth Books decided to re-release the book in 2018, as part of the state’s bicentennial celebration. “The annotation that I have added to this new edition provides a little more elucidation of what was going on and the sources that Pickett must have been using that he didn’t always cite,” Pate said. “Pickett was taking the reminiscences and memoirs of people, and sometimes inaccuracies creeped in – people’s memories were not as good or sharp as they might have been. Albert James Pickett was born in Anson County, North Carolina in 1810, but at the age of 8, his family relocated to the “frontier” in Autauga County, Alabama. His father, William Pickett, operated a mill and trading house, and served in the Alabama House and Senate. According to Pate, when Pickett was a young boy at his father’s trading house, he would listen to stories told by Creek Indians, Indian countrymen and revolutionary war heroes about the history and founding of Alabama. Pickett’s early education was in the local field schools, but he completed his higher education in Virginia. When he returned, he studied law under his brother, who was a judge in the Sixth Judicial Circuit. While Pickett never practiced law, “the law training he received under his brother and by visiting courts taught him document analysis – how to evaluate witnesses and stories,” Pate said. He used those skills in his early writing career for the newspaper in Montgomery. Within a few years, Pickett received acclaim for articles and pamphlets he had written, so he decided to write the history of Alabama. “He spent the better part of four years doing research on his beloved Alabama,” Pate said. Pickett developed a series of questions that he asked each person he interviewed. “He really did a very modern kind of oral history interview, but most of them were through letters,” said Pate. These letters, known as the Pickett Papers, are preserved at the Alabama Department of Archives and History. When the book debuted in 1851, “it was an overnight success and went through three editions” in its first year, Pate said. While Pickett had ambitions for other research and publications, he died in 1858. Pickett has been called the “state’s first historian,” “the planter historian” and “Alabama’s commenter.” Now, thanks to Pate’s years of detailed research and annotation, this invaluable resource will be widely available to the public. The new edition, which is fully indexed, carries an introduction by Pate, combines two volumes in one and is presented in readable wide format: Pickett’s original text and his own footnotes occupy the main part of the page, with Pate’s annotations in boldface in the margins. 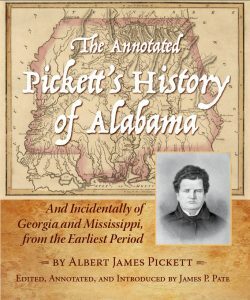 “The Annotated Pickett’s History of Alabama” will be available Oct. 15 through your favorite local or online bookstore or from NewSouth Books at www.newsouthbooks.com.